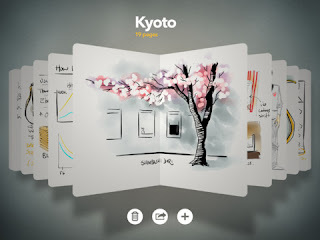 Here's what Paper say about themselves: "the easiest and most beautiful way to create on iPad". Yup they got that right. Paper is a sketch book app for the iPad. 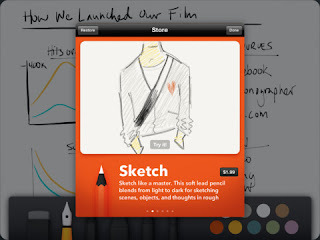 Let me rephrase that, it's a gorgeous sketching app for the iPad. It was designed from the ground up for drawing, sketching, coloring, or outlining on the go. Paper works the way you think, like a familiar notebook or journal. Have all of your ideas with you in one place. Forget reading this post, just scroll down and look at those screenshots below. That will be enough for you to want to install Paper and play around with it. 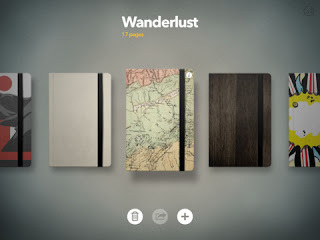 When you first launch the app, you see a beautiful view of all of your notebooks that look very soft and inviting to touch. 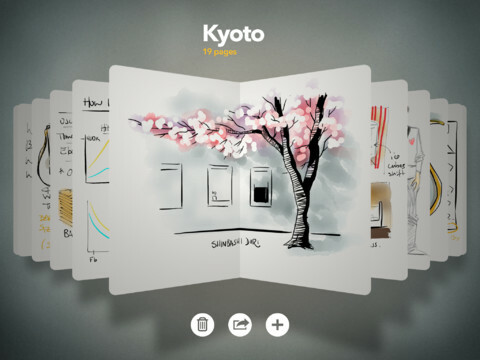 Tap on a notebook and you can flip through its pages, just like you would do with a real notebook. Once you tap on a new page it opens and fills up your entire screen, without any buttons or interface. In order to access your set of writing tools just swipe up from the bottom to see the tools palette and swipe down in order to hide it. One of Paper's cool features is called Rewind. It's their version of "undo". If you make a mistake while drawing just place two fingers on the screen and rotate them counter-clockwise. The app will then retrace what you did, stroke by stroke. It's the type of feature that you'll wish all apps have, just like the pull-to-refresh that Tweetie introduced (now called Twitter for iPhone). Paper supports the new iPad's retina resolution, with a full 2048x1536 canvas. Once you have created something you can send your pages to Tumblr, send them over email, or share pages with your friends on Facebook and Twitter. 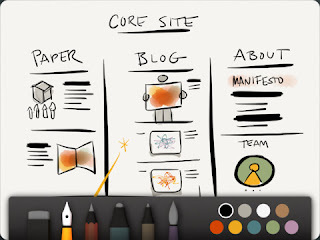 Paper is free in the AppStore and is available only for iPad. Once inside the app you can purchase additional tools.